The construction industry can be risk averse, but one of create‘s Most Innovative Engineers is trying to shake that attitude. In the mind of civil engineer Wes Johnston, engineering and innovation are synonymous. Growing up on a farm taught him a few things about “finding a way to make things work”, and he’s carried that same attitude through the 30 years of his engineering career. 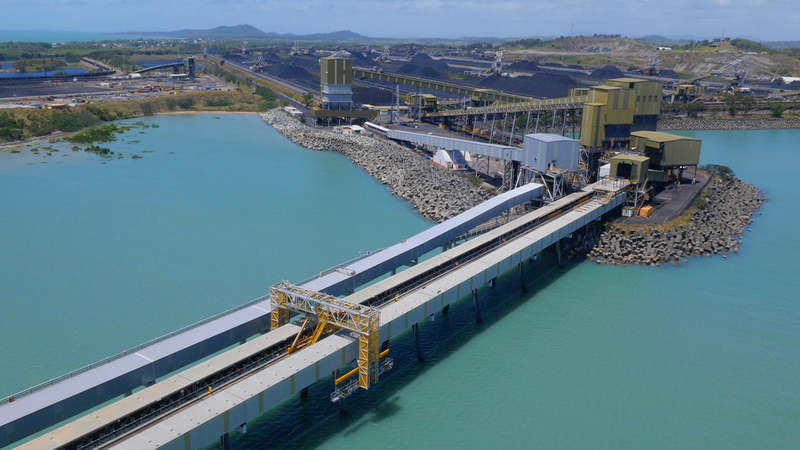 This penchant for problem solving has served him well, most recently when he was tasked with developing a custom mobile swing-stage gantry for Dalrymple Bay Coal Terminal (DBCT) near Mackay, Queensland. One aspect crucial to DBCT’s function is a 4.2 km-long jetty. The jetty is in a tidal zone, so access and safety are paramount. Workers need to move up and down the piles in a matter of minutes with the daily tide, and relocate quickly along the jetty. As the name suggests, the mobile swing-stage gantry comprises a set of swing stages that go up and down the piles, suspended by a pair of beams that can swing in and out from under the jetty. It’s supported by twin masts that can be raised and lowered to clear the deck, with the whole structure on wheels to move along the jetty. According to Johnston it was a simple solution, but the returns were manyfold: it removed repetitive building and stripping of suspended scaffolds, cutting costs and downtime in the process and improving access along the jetty roadway. The idea actually started with a scribble on a piece of paper, but it caught the eyes and imaginations of the terminal operators and engineering operations managers. “Accessing the piles, you’re down underneath an operating roadway and operating conveyors, and they typically do that using scaffolds,” Johnston said. From there the idea was fleshed out to include sketches, timelines, costings and advantages. Johnston said it was a pleasant surprise to see everyone’s enthusiasm for the project and receive the support from his peers. “Being a process facility and being around for so many years, they’re very set in their ways and traditional methods,” he said. In the year that the gantry has been operational, Johnston said it’s received nothing but rave reviews from DBCT operators for its simplicity. “Our Engineering Innovation and Technology Group is using this as a textbook example of what can be done when we think outside the square,” he said. Johnston’s efforts didn’t go unnoticed – Johnston was named as one of create’s Most Innovative Engineers in 2017. Johnston said awards like Most Innovative Engineers are important because “it raises the profile of engineering” and helps showcase what it means to be an engineer. Coming up with solutions like the mobile swing-stage gantry was, in his opinion, the best use of his skills as a civil engineer. Out-of-the-box thinking is something he tries to encourage in his employees. “Get out there and experience engineering. Come up with ideas and solutions and put them out there,” Johnston said. Wes Johnston receiving the Engineers Australia Individual Bradfield Award for the Practice of Engineering. The mobile swing-stage gantry has scooped up other awards and nominations since then. 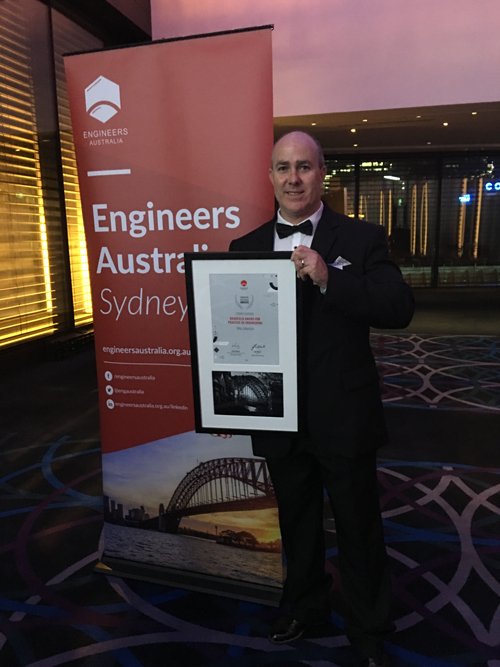 Shortly after making the Innovative Engineers list, he was awarded the Engineers Australia Individual Bradfield Award for the Practice of Engineering. “To be recognised from the calibre of entrants as the winner by the judges, for someone in the construction field, was truly unexpected and a remarkable experience,” Johnston said. The gantry also won the Queensland Major Contractors Association inaugural Innovation and Excellence Award, and was a finalist in the National Safety Council Awards. “The Most Innovative Engineers award was the open doorway to these awards,” Johnston said. He said he tries to stress there is always room to throw ideas around, because like questions there’s no such thing as a bad idea – just some that end up being better than others. “I think that’s something that’s been lacking in construction. Everyone’s just focused on delivering, and we have contracts where you have a set of specifications and a budget to work to. You are very channelled in how you go about delivering projects,” he said. “Whereas with this one, [the process] being as open as it was, we had the latitude to talk about things, try different things and work as a team to come up with the best solutions. That’s what I try and encourage, and I use the Most Innovative Engineers award as a good example of that, as to why we need to do it. Wes Johnston is one of create‘s Most Innovative Engineers for 2017. Nominations are now open for the class of 2018. To nominate yourself or someone else, click here. What does it take to bring the world’s oldest underground railway up to speed?